GM Tails » Changes It May Work…Or So They Say! Changes It May Work…Or So They Say! First of all I am not stranded in Somalia on a ship besieged with pirates and then running swords through said pirates. As much as I would kind of want that to be true alas it is not. I can come up with the excuses telling you I’ve been really busy and that’s why I haven’t been writing, but that the case may be I’m not saying that’s because not true, it’s because I’ve been busy and not inspired. Being given a swift kick to the posterior by your cats (I’m pathetic) really gets a person into gear. So I am introducing the redesigned site now with 150% more cat pictures and the occasional blog post. 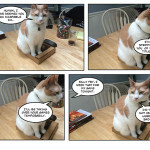 GM Tails (comic) will update, starting next week, on Wednesdays. 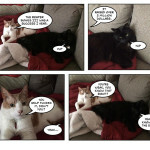 I have lots of little things to say but it can only be expressed in cat pictures attached with speech bubbles. They would be drawings if I had an ounce of artistic talent. I know the saying, if you practice for ten thousand hours you will become a professional at it. 10,000hr/24hr= 416.66666 etc days. I’m afraid that I am too much of a fan of sleep to accomplish such thing, but I shall start with stick figures and work my way up. 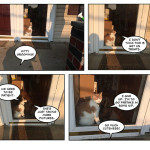 For now the comics will be kitty pictures. I love you all. My cats want to be fed. I feel their eyes on me and French Fry’s teeth on my leg.